Who says Oktoberfest is only about beers and sausages? I whipped up a sweet treat to cap off this month's festivities. Place chocolate and heavy cream in a heat-proof bowl or double broiler over simmering water (making sure the bowl doesn't touch the water. Let chocolate and cream heat up for 3 minutes. Whisk mixture until fully incorporated. Remove bowl from heat and let cool for about 20 minutes. Slowly stir in beer. Pour finished mixture into a shallow dish and cover with plastic wrap. Refrigerate until set, about 3 hours. Take truffle mixture from refrigerator. Using a melon-baller, scoop out the truffles. Form truffles by hand and place on parchment-lined bake sheet. Dust truffles with unsweetened cocoa powder to finish, chill until ready to serve. It may seem too soft but you can place it in the freezer for 10 minutes to harden a little bit more for easier molding. If you don't have a Melon-baller, just use a regular spoon to get the more rustic truffle shapes. Pair this sweet treat with a bottle of dark brewsky. Yum-O! 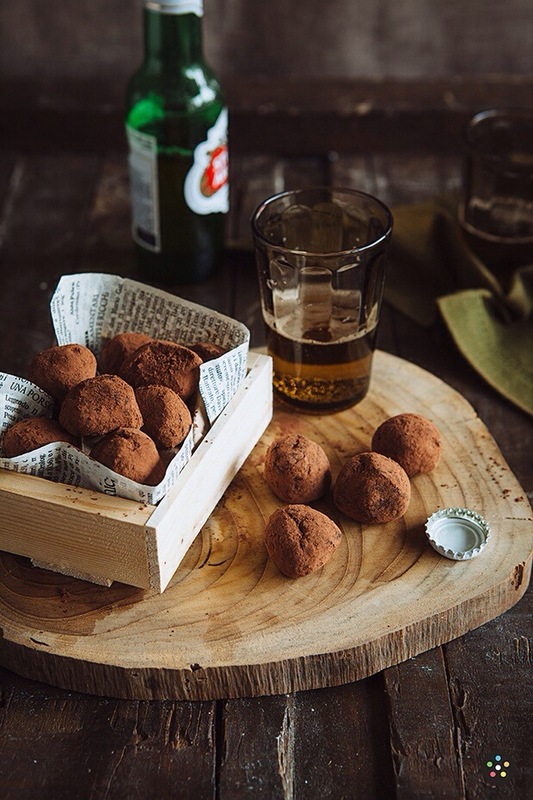 Recipe for Chocolate Beer Truffles on Pepper.ph!